80 days. (Indeterminate) [Italian heirloom, famous for its use in Neapolitan pizza and other Italian dishes.] 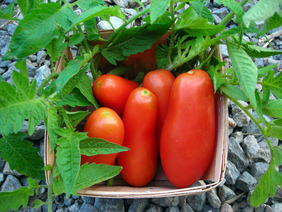 Long Roma-type tomatoes, 3-4 oz fruits with pointed ends. Thick, dry, low acid flesh contains few seeds. Very productive 6 ft. tall plants have good disease resistance. Excellent canning variety for recipes with sufficient acidity. Pkt.